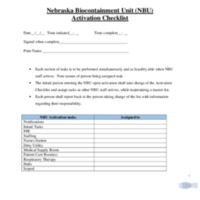 Description: Checklist for when the NBU is being activated. 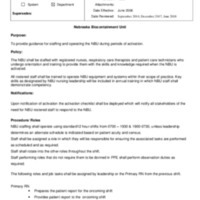 Description: Policies and Procedures Manual: To provide guidance for staffing and operating the NBU during periods of activation. 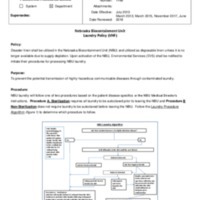 Description: Policies and Procedures Manual: To provide guidance for removing waste items from the NBU. 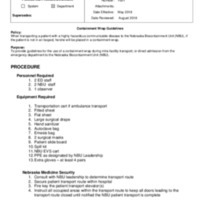 Description: Policies and Procedures Manual: Instructions on how to set-up the Isopod to allow for the safe transportation of a patient with a highly hazardous communicable disease. 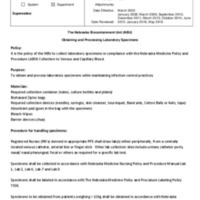 Description: Policies and Procedures Manual: To obtain and process laboratory specimens while maintaining infection control practices. 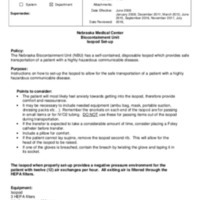 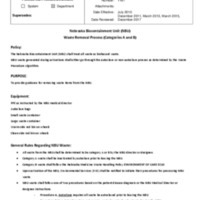 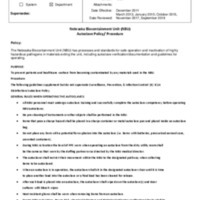 Description: Policies and Procedures Manual: To provide guidelines for the use of a containment wrap during intra-facility transport; or direct admission from the emergency department to the Nebraska Biocontainment Unit (NBU). 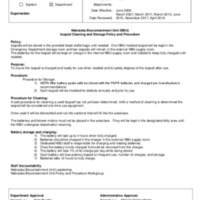 Description: Policies and Procedures Manual: To prevent patients and healthcare workers from becoming contaminated by any materials used in the NBU.